Zach and I are going to try an experiment. Like Prindle and one of his co-workers, we are going to attempt a joint review of some albums. Seeing as we both own Goo, why not offer two perspectives on it" My comments will be listed in the normal font, and Zach�s will be pasted as a sort of rebuttal (he will have read my remarks by the time I post his) in black font. 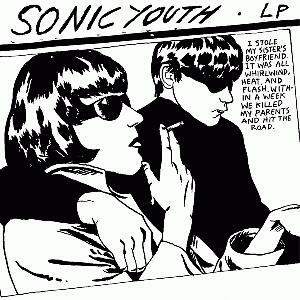 Goo would be the point in Sonic Youth�s career where most bands would severely compromise their style in order to gross more record sales. After the legendary Daydream Nation and the less renowned Sister, Sonic Youth had proven themselves to be masterful creators of beautiful and original melodies. However, Sonic Youth lost their Sonic Youthfulness (that�s becoming a word now� if W can do it, I can too) in creating this album. Most of the tracks have a somewhat generic feel to them. At this point, Sonic Youth had exhausted one of their signature sounds, and was in desperate need of a new musical identity. While this wouldn�t be fully played out until Dirty, Sonic Youth was riding a wave of popularity that led to what was a rather conservative, unchanging sound for them. Goo combines some of the best elements of Sonic Youth with some of their least creative songwriting to form what amounts to be just another good album, but nothing special. Eben�s take: Whole lotta feedback. I won�t rate this one because it doesn�t have lyrics (even Mildred Pierce does), and it�s just a bunch of distorted guitar noise. This is a good, solid album. It is very listenable and highly enjoyable. 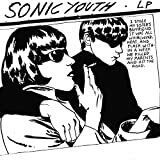 However, it simply does not possess the inventiveness of some of the other Sonic Youth releases. In the grand scheme of things, it is nothing special. I really love it, and I honestly think that it�s better than Dirty. However, there is no particular reason that a music fan should buy this album if they don�t already have an affinity for Sonic Youth. Likewise, SY fans who understand what the band is capable of will likely be disappointed with this release. Sonic Youth was approaching a crossroads in styles at this point. They had kept a sound since Sister and would continue to do so. This is a strong album, and for sonic qualities alone should probably receive better than a B. However, it is rather uninspired and uninspiring as a whole, and almost uncreative. Nice review, but I like "My Friend Goo"
Nice review, but I think you robbed "Dirty Boots" and "Mary Christ". very good review, very good album. although i find "My Friend Goo" to be a very fun song, and i would score "Cinderella" a 5/5. and i agree, it doesn't have the "click" that other SY albums have. its a great CD, but not good for long-term listening, as it can get old. Unfortunately, Daydream Nation is the only SY album I have. But nice review, I'm defnitely going to have to check out Goo. I like everything up to Mildered Pierce, then it goes downhill. Mote and Dirty Boots are two of my favority SY songs. In canada 85 is an A. lol I've yet to hear some Sonic Youth but I'm under the impression that they are like Nirvana and Soundgarden, like sorta Grunge-like. The first time I listened to this was months and months ago, and it still gets better every time I listen. Tunic (Song For Karen), Mote, and Kool Thing are all ridiculously good songs. +1 For My Friend Goo being the worst SY song ever, closely followed by the "SHE'S JUST A KITTEN" song. Miranda July is Kim Gordon's fault. Shame on you, Kim. Looks like I'm gonna have to review this album. I like this is better than Daydream Nation. you mean mine? It got deleted by the site crashing a while back, which isn't really a bad thing.